Enrolling your child in gymnastics lessons at any age boasts a myriad of benefits, but what about preschool gymnastics benefits? Gymnastics enables toddlers and preschoolers to develop crucial skills at an early age, preparing them to be successful later in life. With approximately one in three children considered obese in the United States as of 2010, there’s no better time than early childhood to enroll your child in an athletic activity. In fact, research shows that as young people age, physical activity declines with time. Gymnastics for preschoolers helps young children and toddlers build crucial strength, balance, flexibility, and coordination skills needed to further develop physical fitness later in life. The Centers for Disease Control (CDC) recommends that children between the ages of six and 17 get up to 60 minutes of exercise per day, and preschool gymnastic moves satisfy these daily requirements. Gymnastic lessons help to teach children from an early age how to have a strong sense of self-discipline and a high sense of self-esteem. But did you know that the development of basic preschool gymnastics skills, such as bilateral movements and basic gymnastic moves such as tumbling for beginners, could help to benefit communication between the brain’s two hemispheres? Reading is a balanced coordination of both of these hemispheres, and gymnastics similar coordination can help a child to learn a complex skill or routine easier. This will directly translate into an enhanced classroom performance. 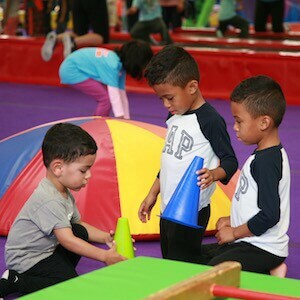 One of the crucial preschool gymnastics skills developed through being on gymnastics teams is the ability to work well with others and to work as a team. 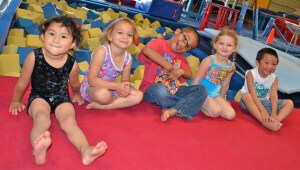 For gymnastics lessons, participation is tantamount to having a successful team and lesson. Children are also required to listen to their coaches and instructors, gaining an understanding of active listening and respect for elders.